Back Design Reversible shield and floral design in red and white. Companion Material 96-page bound miniature companion book, with meanings for both trumps and pip cards. In English. Previously published in a small limited edition run of 50 copies during the 2005 Melbourne International Tarot Conference, Major Tom’s Tarot of Marseilles has been picked up by new Tarot publishers, Schiffer Books, for its second and more extended print run. Tom’s colourful and contemporary Marseilles images have been updated in some small ways for the new edition. In outline they are very similar, but background colour blends have been refined and there is the odd refinement in symbolic colouring (for example, the Emperor’s previously red and yellow cap is now royal purple and yellow; similarly the Queen of Swords now wears purple and blue). The titles, previously inset at the base of the card scene, have been moved to the base of the outer white border. As you’d expect, there are also changes to the Two of Coins to update the date, and the Two of Cups to update the publisher’s name. The major addition in the second edition is the companion book, also written by Major Tom. The 96-page companion book is roughly booklet size - the same dimensions as the cards – but is properly a book in my opinion. It is properly bound, with a cardboard cover and colour illustrations of the cards on its white pages. For the meanings, Major Tom provides just enough to get you started. For the trumps, this is a description and ‘an idea of what the card represents’, underneath a full colour image of the card. 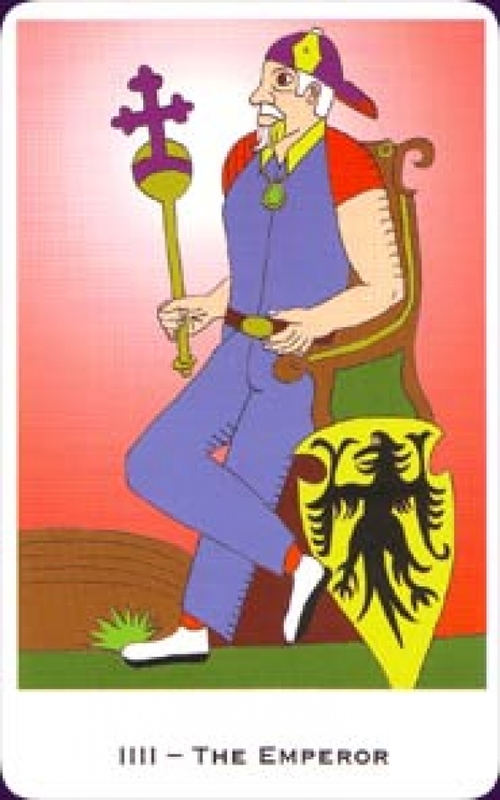 The pip cards have no traditional associations, so you can either use your own with the deck or the suggested keywords that Major Tom collated in his tarot classes, and the courts have short descriptions of the card image and the costume. At the back of the book is a condensed course in tarot and doing your first reading. Throughout the book, Tom’s approach is totally non-dogmatic and he stresses doing what feels right for you. Along with the 78 tarot cards, there are two quick reference cards, The Numbers and The Colors, with a few keywords on each to help with interpreting the imagery (this info is also in the book). The backs of the cards have a very similar shield and floral design to the first edition, though printed here in red and white instead of greyscale. The cards and book are nicely packaged in a sturdy, laminated cardboard box. Schiffer might be new to tarot deck publishing, but I have no complaints about either their choice of decks or choice of packaging! It’s nice to see a solid outer box that protects the cards and won’t go scruffy around the edges as quickly as a regular outer box. This one also differs by opening at the front like a door, the inside angles reinforced with red ribbon. The ‘door’ is also made in such a way as to click satisfyingly shut and so the cards are safely held inside. The second edition of Major Tom’s Tarot of Marseilles is a polished production, solidly packaged and beautifully printed. The limited nature of the first edition meant it was difficult to secure a copy, but if you weren’t lucky enough to pick up the first edition (or even if you did! ), this special deck and book is now within the reach of everyone.